When your heart beats, it generates a pulsewave down your arteries. The pulsewave travels to your fingers, then back. The shape and rhythm of this wave can help determine the overall health of your cardiovascular system. 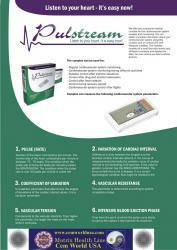 The Pulstream is a device that is meant ot be used as means of control of the human cardiovascular system. The device assigns an overall score to your cardio-vascular system.